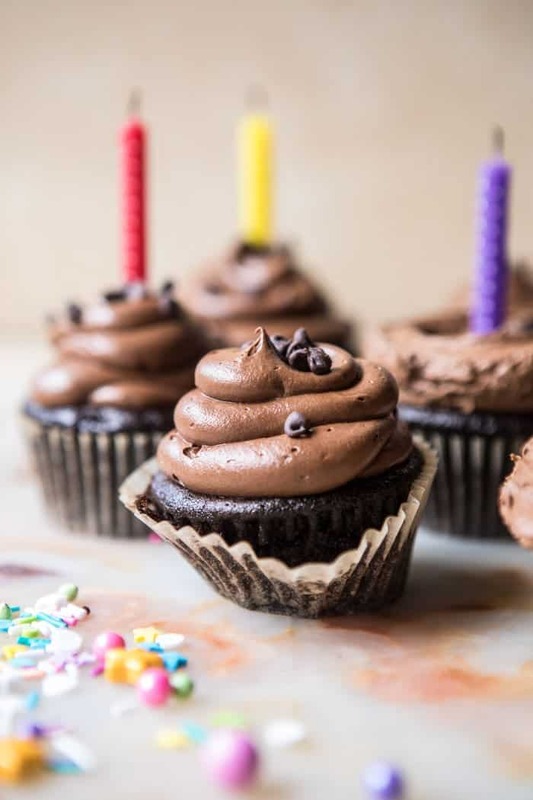 The BEST chocolate birthday cupcakes…with fudgy chocolate buttercream! This is the perfect Friday recipe, right?! 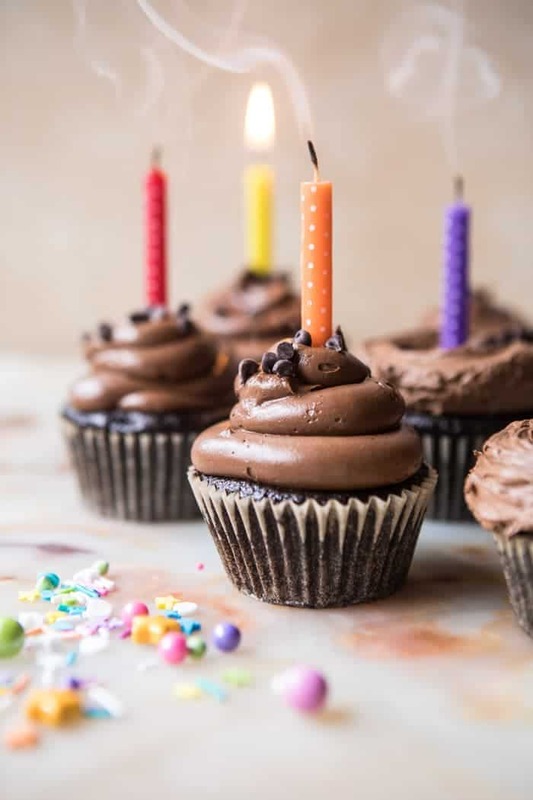 Even if it’s not your birthday, we can certainly pretend, because trust me everyone needs a cupcake today. Yep, I’m just feeling like the world could use one or two. Now, I know cupcakes can’t really solve all the problems of the world. 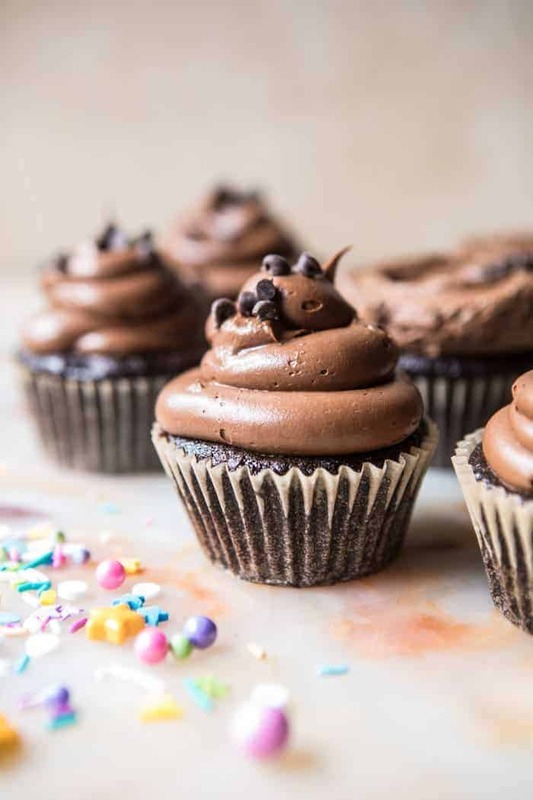 But you gotta admit, there’s something pretty wonderful about sitting down with a delicious chocolate buttercream cupcake that seems to melt away the problems of the world…if only temporarily. As a lot of you already know, my adored little sister, Asher, celebrated a birthday this week. 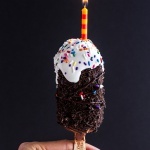 And as is tradition, every year I make a recipe for the blog that is birthday inspired. After all, she is my favorite (and only) little sister. Are you seeing a pattern? Lots and lots of chocolate, Asher’s favorite. Last year’s vanilla birthday cake was a pretty big stretch for me, but I was able to convince her with the whipped chocolate buttercream. 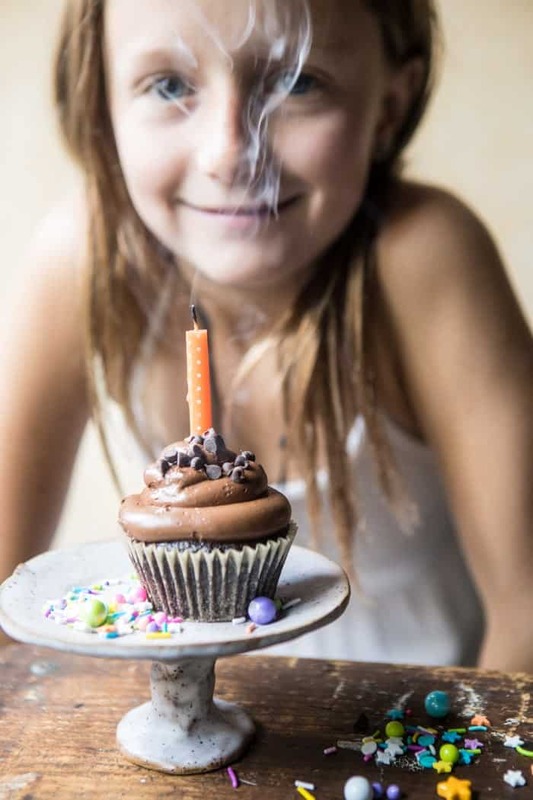 She actually ended up loving that cake…and realizing that maybe, just maybe, there might be a few great non-chocolate desserts out there too. Anyway, in previous years I’ve surprised Asher with a new cake recipe. But I’m going to be honest, most of the time she just ends up asking me to make her a regular chocolate cake. So this year I decided, instead of surprising her with one of my over the top cake creations, I would just ask the girl what she wanted. To be expected she said chocolate cake, but this year she wanted the cake in the form of cupcakes! For some reason Asher is really having a moment with cupcakes. Can you blame her though? Cupcakes are cute, hand-held, and an all around fun and delicious dessert. Plus, I personally think cupcakes are small enough that it’s totally acceptable to go back for a second. Obviously. 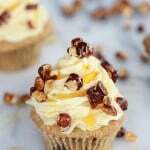 It’s not very often that I do a super classic recipe like these cupcakes. But every once in a while I like to throw a classic into the mix, because sometimes, you really just cannot beat the classics. 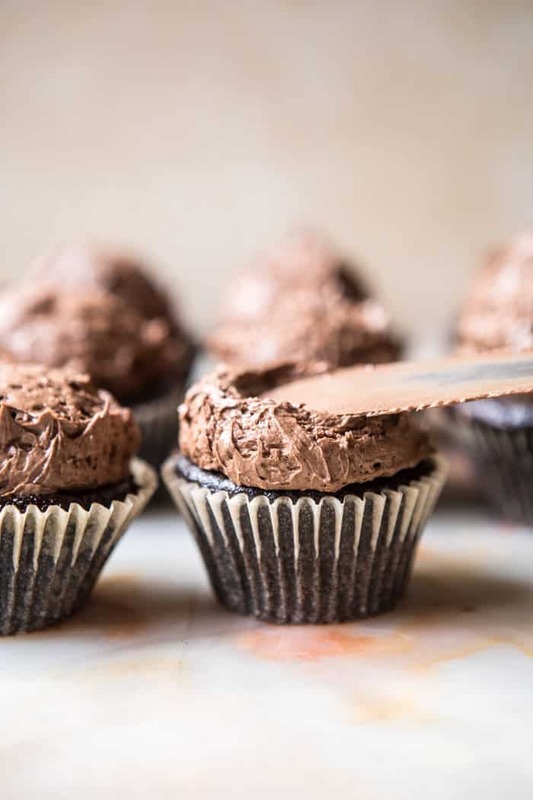 And let’s be real, everyone needs a good chocolate cupcake recipe in the their back pocket. It’s kind of a must. The best part? 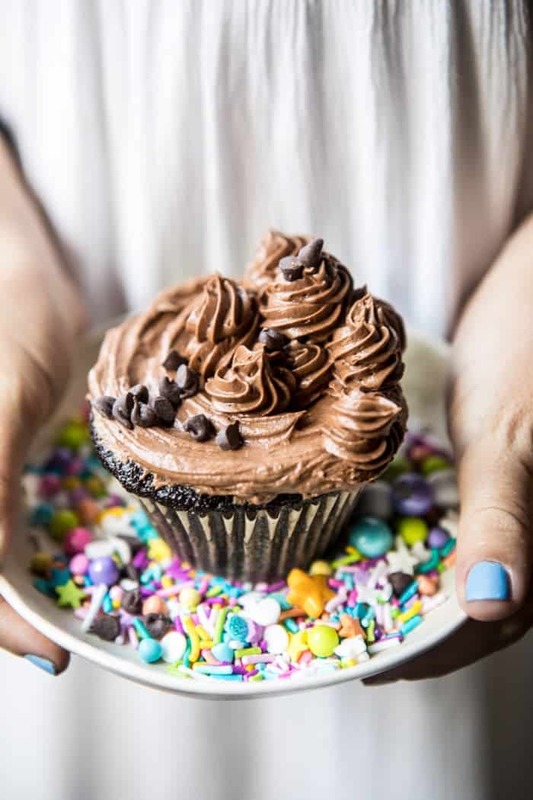 This cupcake recipe is SO easy. I’m talking ONE bowl for the cupcake batter, and ONE bowl for the buttercream. Honestly, these are so simple that the thought of running to the store for a box mix will not even cross your mind. And trust me, these cupcakes are million and one times better than anything out of a box. The cake itself is incredibly soft, moist, and extra fudgy, with just the right amount of chocolate flavor, and the perfect amount of crumb. As the title states, these cupcakes are the BEST! I know, kind of bold, but these cupcakes have been made one hundred times over now, and they really just cannot be beat. 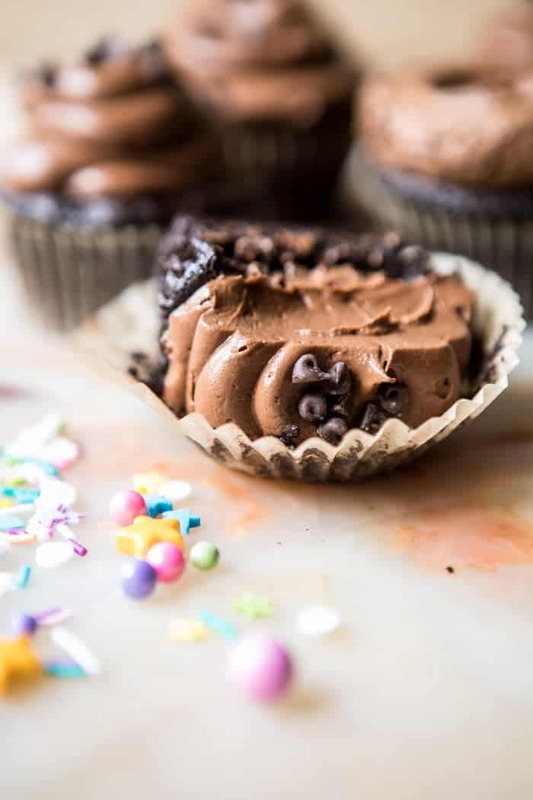 My little secret to making these cupcakes extra delicious? A couple of handfuls of mini chocolate chips stirred right into the batter. And the frosting? 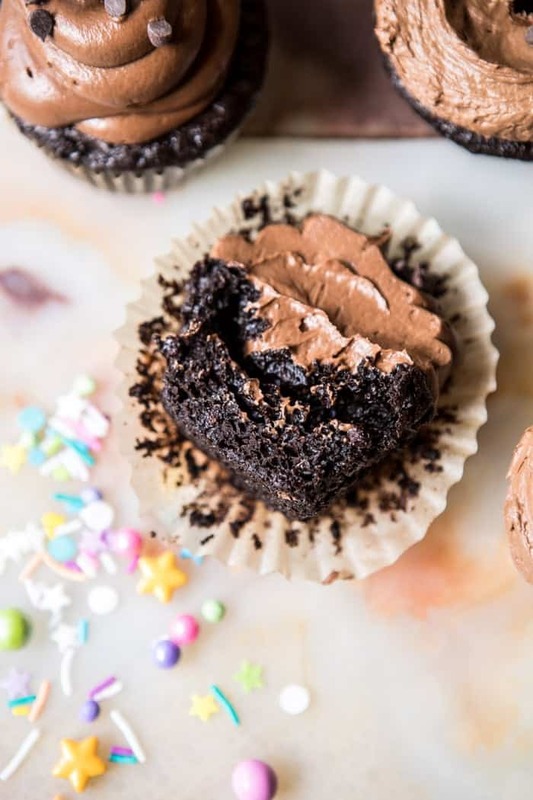 Oh the frosting, it’s basically chocolate buttercream heaven, and the only real way to truly complete these cupcakes. Also, I feel as though I should mention that everyone I make these cupcakes for likes the ratio of cake to buttercream to be close to one to one. This means my buttercream recipe makes a lot of frosting. I’d say you could downsize the recipe a bit, but then really, would you really want to do that? While we might not all be celebrating a birthday this week, we are heading into a long holiday weekend. 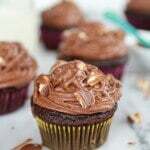 Therefore, I could not think of a better recipe to send you guys off with than these chocolate cupcakes. Perfect for any and all labor day activities! Possibly the best chocolate cup cake ever! 1. Preheat the oven to 350 degrees F. Line 24 muffin tins with paper liners. 2. In a large mixing bowl, beat together the eggs, buttermilk, greek yogurt, canola oil, and vanilla until smooth. Add the flour, sugar, unsweetened cocoa powder, baking soda, baking powder, and salt. Mix until there are no longer any clumps of flour. Add the hot coffee and mix until combined. Batter should be pourable, but not super thin. Stir in the chocolate chips, if using. 3. 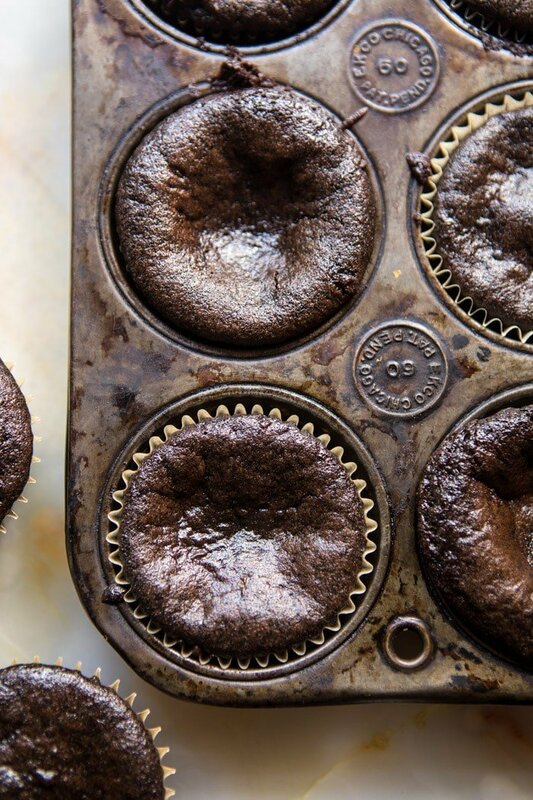 Pour the batter among the muffin tins and bake 15-18 minutes, until a tester inserted into the center comes out clean. Remove and let cool completely before frosting. 1. In a large mixing bowl, beat together the butter and powdered sugar until the butter is light and fluffy, about 2 minutes. Add the cocoa powder and vanilla and beat, scrapping down the sides as needed another 2 minutes or until there are no streaks of white. Add 3 tablespoons of the heavy cream and whip the frosting for 2-4 minutes or until light and fluffy. If desired add the remaining tablespoon of the heavy cream. Taste the frosting and add more powdered sugar if you like a sweeter or thicker frosting. 2. Frost each cupcake as desired. The cupcakes will keep for 3-4 days in the fridge, bring to room temp before eating. Meaning you need to make them. I really cannot blame her on the cupcake part! 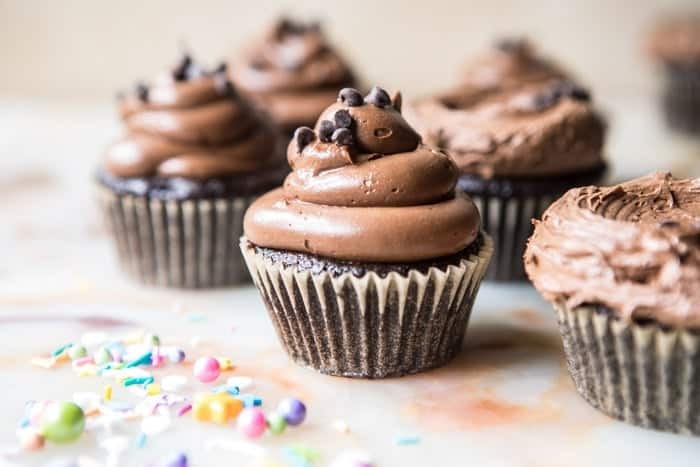 You make these cupcakes look so absolutely divine! The frosting looks so delicious. Thank you, Amanda! I hope you have a great weekend! OMG, I LOVE the smoke shots! Those photos are really cool! And let’s be honest, I kinda want to face plant into those cupcakes. Thank you so much, Christina! Have a great weekend! ps. I agree with the face planting. LOL. These look delicious – is the recipe already altitude adjusted (I’m in Denver), hoping so. Perfect recipe going into the holiday weekend–these look beyond amazing. Thanks for the Friday treat Tieghan and happy belated to Asher! I’m allergic to coffee. Can I leave that out of the cupcake batter, or will that ruin the recipe? These are awesome. 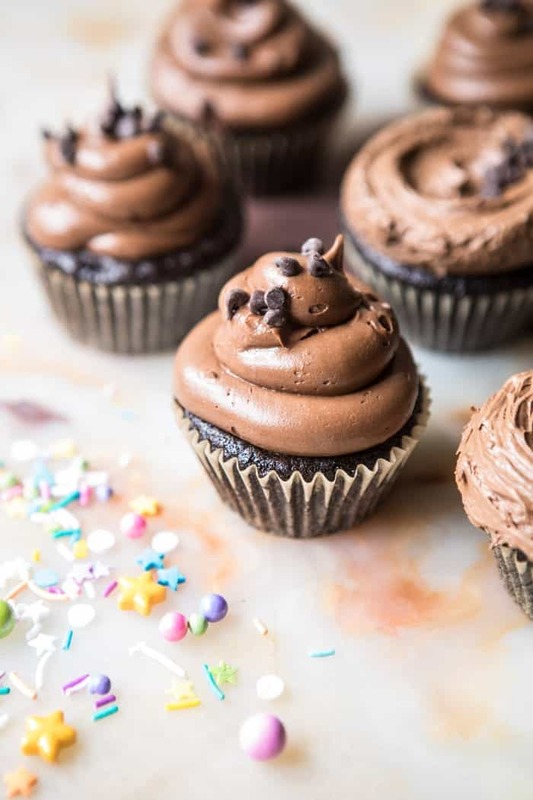 I love a good cupcake (especially chocolate), and these look perfect. And you’re such a sweet sister. I think it’s so cute how you do a new recipe for her birthday each year. She is lucky to have you!! 🙂 Have a great long weekend. Happy Birthday Asher, what an awesome sister you’ve got! I will tell her you said happy birthday! THANKS! I went back to see what I wrote three years ago. I couldn’t wait for your cookbook to come and I thought you should use your cake picture on the blog because it was so good. Now there will be a studio and even more incredible recipes and pictures to come. Congrats on three more years and Happy Birthday Asher. Awe! Thank you so much, nancy! I am beyond flattered! Hope you had a great weekend! These cupcakes look soo amazing. Happy Birthday to Asher!. I can’t wait to give it a try, Teighan! can i have one? now? haha! I wish I could share! Thanks Ruth! Oh I love it! I bet asher was stoked for the extra chocolate love this year. They look EPIC! Just a quick question – do I need to sift the powdered sugar or is it unsifted? This looks just wonderful and I have a cake to make this week! HI Debra! No need to shift the powdered sugar. Hope you love the cupcakes! That frosting looks out of this world! I will be saving these because my kiddo turns two next month and I’ve been thinking about cupcakes! Happy birthday to Asher! What a perfect treat. haha! Not at all! That is such a compliment. Thanks Lisa! Hey Nancy! Yes, baking in a 9×13 inch pan works great. I would bake for 25-30 minutes. Hope you love the cake! Your chocolate cake recipe is my absolute fav and I was going to attempt to covert it to a cupcake recipe. I am so stoked this recipe now exists!!! Can’t wait to try! Thank you, Aimee!! Hope you love the cupcakes! My birthday happens to be today so perfectttt timing! these look unbelieveable!! YEAHHH!! Happy (late) birthday! Hope you had a great day! 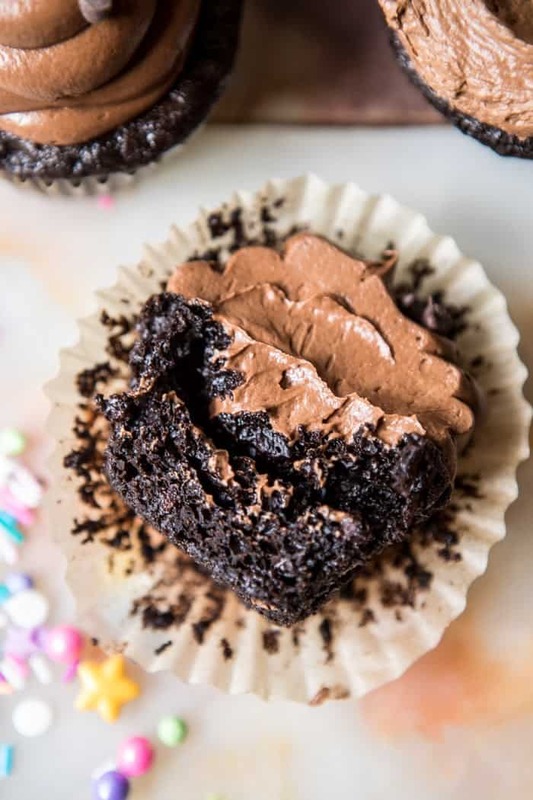 These are SO fluffy and fudgy and perfect!!! 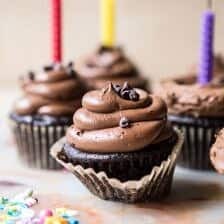 It’s coming close to my birthday I think I’m going to make these cupcakes to offers to friends as dessert I’m sure I’ll please everyone. Happy almost birthday! Hope you love the cupcakes! I tried this recipe. Trust me it is really very yummy. Thanks for sharing such a mouth watering recipe. So happy you enjoyed the cupcakes! Thank you! While scrolling down this recipe I realized my mouth was watering! Too bad it’s only Monday… I will keep this recipe in the back of my mind until this weekend. Can’t wait! Haha I am so glad you love this Stine Mari! Thank you! I made these cupcakes and the frosting. Was amazing. How do I make the frosting go just be white instead of chocolate ? Want to make it again but with vanilla frosting. I’ve never done homemade frosting before. HI! Just simply omit the cocoa powder from the frosting. should be great! Thrilled you love the cupcakes. Thanks! Hi there, These look amazing. I want to make for my son’s birthday this weekend. Does this recipe require a mixer or can it all be done by hand? P.S. I pretty much make at least two meals from your site each week. Love it! Also, THANK YOU! That makes my day. Hope your son loves the cupcakes!!! These look amazing! Just wondering if there is anything I might be able to substitute for the coffee?? I can’t have coffee, but would love to make these! Have you done this with Dutch processed cocoa powder? I know it doesn’t react with baking soda so was just curious. 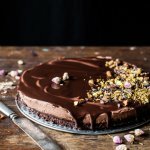 Would this recipe be enough to make 3 8in round cake layers? And how long would it take to bake? I’d love to make this into a chocolate layer Cale. Sounds delicious! !